Well! I've got some catching up to do. It's been a very busy week! I finally got my new website up and running. You can take a look at it here: Zeh Original Art . These rhodies are so beautiful blooming right now in my garden. The thing I love about them is that they come out just a bit later than the pinks and reds which mean they are still blooming long after the others are past. Do you see the bee on one of the blooms? This painting has been sold. 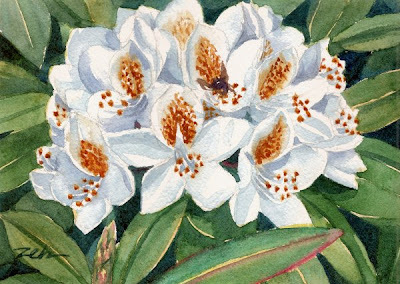 You can find my floral paintings and prints in Janet Zeh Etsy shop and botanicals here. Thanks for stopping by!